Facial recognition or identification has for a long time been used by law enforcement officers and forensic experts for tracking down antisocial and recognizing badly mutilated corpses. Nowadays, face recognition technology (in the form of software applications) is finding increasing application in other spheres of human activity. If recent studies and researches are to be believed, the topnotch algorithms relating to facial identification can compete with the best of forensic specialists. 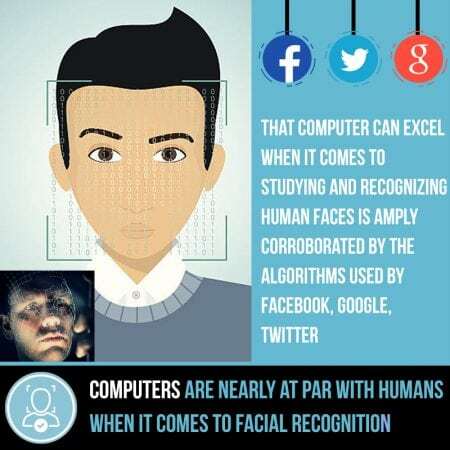 That computer can excel when it comes to studying and recognizing human faces is amply corroborated by the algorithms used by Facebook, Google, Twitter, and other well-known portals for identifying images in subscribers’ profiles. Facial recognition scientist employed with the National Institute of Standards and Technology, Jonathan Phillips strongly believes that the most excellent face recognition formula can compete with the best forensic scientist or expert. John along with his team carried out a survey where they offered 20 pairs of complicated images to an array of algorithms and human specialists for review and identification. Surprisingly enough, the algorithms matched the human experts in performing the assigned tasks. The research team also came up with another crucial finding-an algorithm and human working in concert performed better than two humans coordinating together. The researchers came to the conclusion that results were more accurate and superior when the human intellect collaborated with computer codes. The study conducted by Jonathan and his team has been published in the ‘Proceedings in the National Academy of Sciences’. It is now for the face recognition community and forensic agencies to take advantage of Phillip’s findings for carrying out identification with greater accuracy. And Jonathan has also made it clear that face identification experts do not need to worry about losing their jobs as the algorithms still have a lot of ground to cover for giving humans a run for their money. Nevertheless, algorithms, going by their current level of competency can at best help scale down the options. It is still up to the human to take the final decision-so he has to trust his or her instincts more than the algorithms. And since it is humans who are toiling to enhance and fine-tune the accuracy of the algorithmic systems, it would not be out of place to mention that they’d seriously mull over the kind of person that they’d in that sensitive position. Next PostNext Is It Worth Investing In Internet Marketing?